Writer's note: As those readers that follow MousePlanet social media channels know, I was away from the Walt Disney World Resort this past week, invited by Disney Cruise Line to sail aboard Disney Magic from Miami, Florida, for five nights to the Western Caribbean, including a visit to Disney's Castaway Cay and a Marvel Day at Sea with the debut of Captain Marvel. It was a voyage filled with fun and top-notch Disney entertainment and service; I will have a full report as a separate article here on MousePlanet soon! Disney Parks Blog provided an advanced look at Captain Marvel's debut last week too. 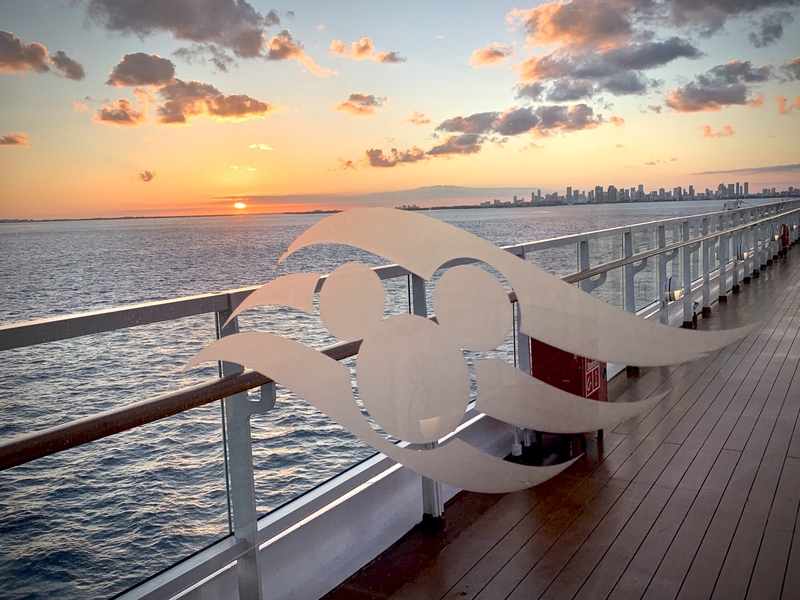 Setting sail from Port Miami, Florida, just before sunset, "Disney Magic" voyaged toward the Western Caribbean with Miami and the sunset to its aft. 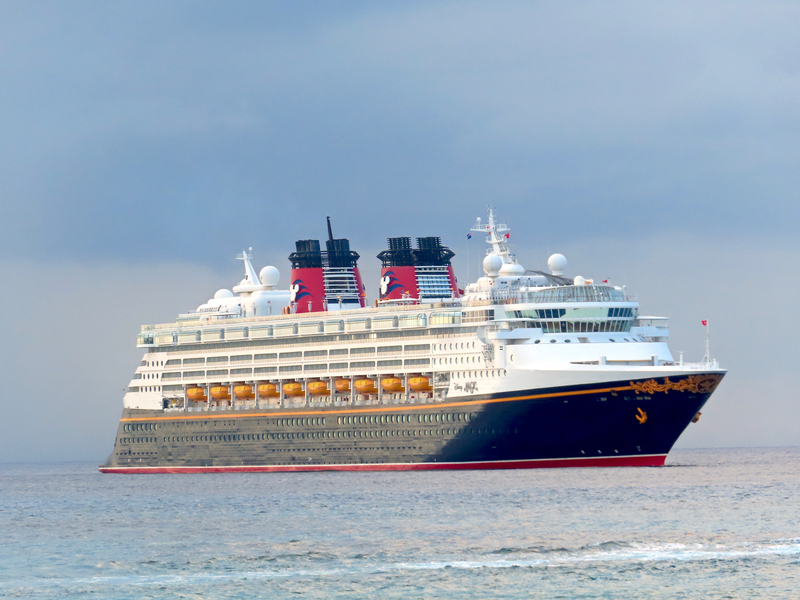 At Grand Cayman Island in the Western Caribbean, "Disney Magic" sits off shore; guests going ashore from this port must take a tender (a smaller boat, similar in size to a double-decker version of Epcot's Friendships). 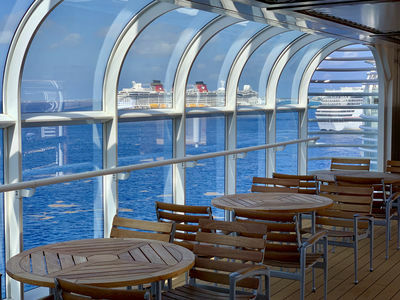 While in port at Grand Cayman Island, "Disney Magic" was joined by "Disney Fantasy" allowing for unique views from one Disney Cruise Line ship to another. 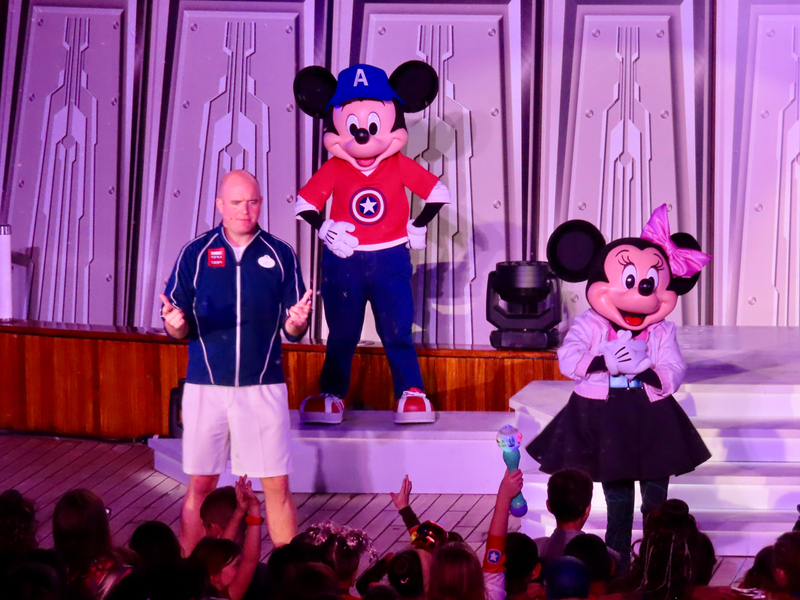 Marvel Day at Sea included a "Mickey & Friends Super Hero Celebration" deck party, featuring the characters paying homage to some of their Marvel favorites. Visiting George Town, Grand Cayman requires taking a tender to and from the ship, offering a great view of the stately bow of a Disney Cruise Line vessel like "Disney Magic." Video by Alan S. Dalinka. Captain Marvel made her Disney Cruise Line debut during the media-invited cruise aboard "Disney Magic," and her big screen debut is coming to theaters on March 7, 2019. Photo by Alan S. Dalinka. Back at Walt Disney World Resort, lots of new things get underway on Friday. Watch our social media channels this week for more and a wrap-up in next week's Update. First this week, on Wednesday, we will bring you highlights of a media preview of the third edition of Epcot International Festival of the Arts ahead of its Friday opening (and, of course, you can visit this page of DisneyWorld.com for an overview of the Festival). 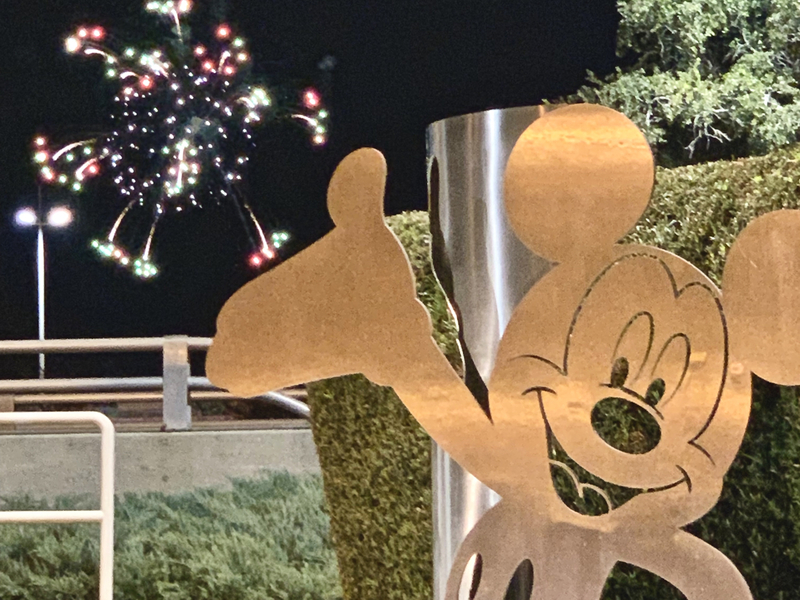 On Friday, we will also bring you highlights of our first look at Mickey & Minnie's Surprise Celebration at Magic Kingdom, including the new "Move it! Shake it! MousekeDance it! Street Party" and the Party with Pixar Pals at Disney's Hollywood Studios. Before next week's Update, we will also try to bring you the highlights of Disney's Animal Kingdom's celebration of 25 years of The Lion King and more. Inside Disney Parks provides a look at some of the latest entertainment coming to Walt Disney World Resort this week and beyond (plus a bit about Disneyland Resort too). Video ©Disney. 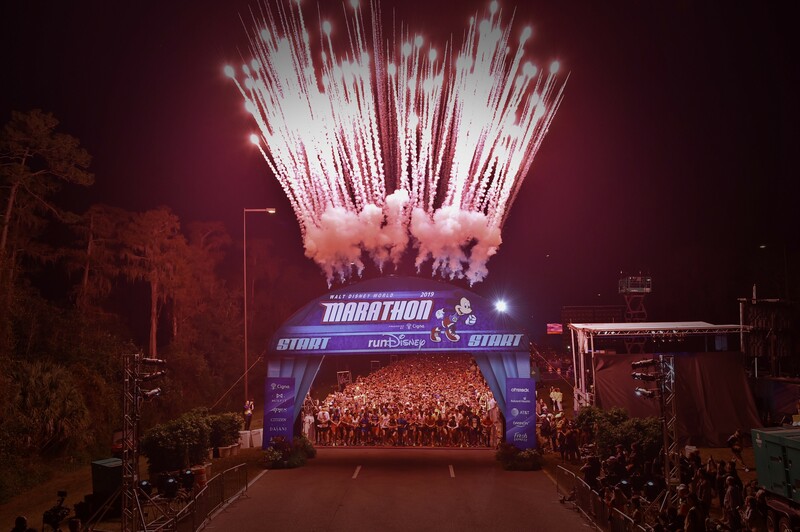 The biggest runDisney event of the year, the Walt Disney World Marathon presented by Cigna, took place over this past weekend. Fredison Costa and Giovanna Martins, past champions, respectively won the male and female divisions of the 26th annual event. More than 15,000 runners participated in the 26.2-mile 2019 Walt Disney World Marathon presented by Cigna. Photo ©Disney. 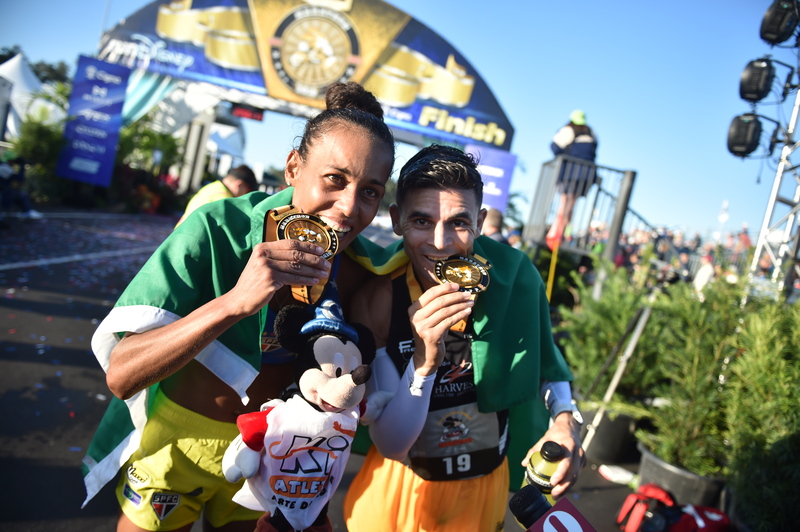 Brazilians Giovanna Martins and Fredison Costa continue their dominance of the Walt Disney World Marathon. Costa has seven of the last eight Disney Marathons. Martins has become the first woman to win four Disney Marathons (2015 and 2017, 2018, 2019). Photo ©Disney. Costa, a native of Brazil who now lives in Kissimmee and trains at Walt Disney World Resort, recaptured the title after struggling through last year's race. 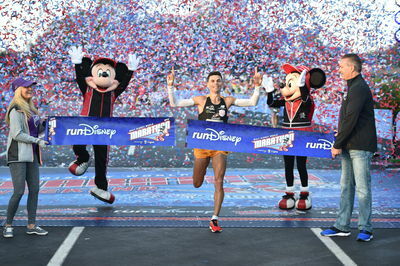 It was his seventh Disney Marathon victory, leaving him one shy of Adriano Bastos' record of eight wins. Running in unseasonably warm Florida weather, Costa posted a time of 2:18:45, well-shy of the race record of 2:11:50, but well ahead of second-place finisher Nick Hilton (2:21:48), the Flagstaff, AZ runner who won the race a year ago, and Jose Lima of Brazil (2:26:40), who was third. Fredison Costa reclaims his Disney Marathon title after struggling in last year's race. He won the 2019 race with a time of 2:18:45. It was Costa's seventh Disney Marathon victory, one shy of Adriano Bastos' record eight wins. Photo ©Disney. Giovanna Martins of Salto, Brazil, is the first woman to win four Disney marathon titles, including the last three in a row. She is the only four-time women's winner in race history after crossing the finish line in 2:45:24 – more than two minutes ahead of Antonia Lins Da Silva of Fortaleza, Brazil, who was second (2:47:36) and Nancy Jurgens of Apex, North Carolina who was third (2:50:39). 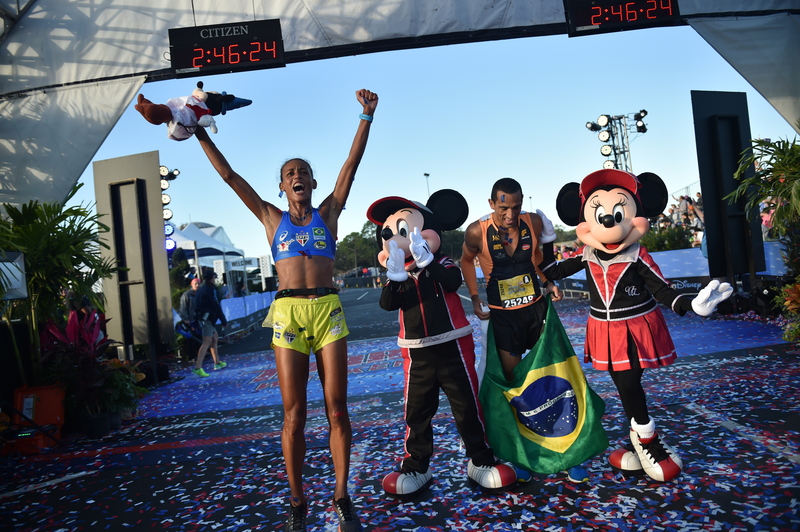 Giovanna Martins of Salto, Brazil, won the women's division of the 26th annual Walt Disney World Marathon presented by Cigna for the third straight year, with a time of 2:45:24, and the fourth time overall. She is the only four-time women's winner in race history. Photo ©Disney. 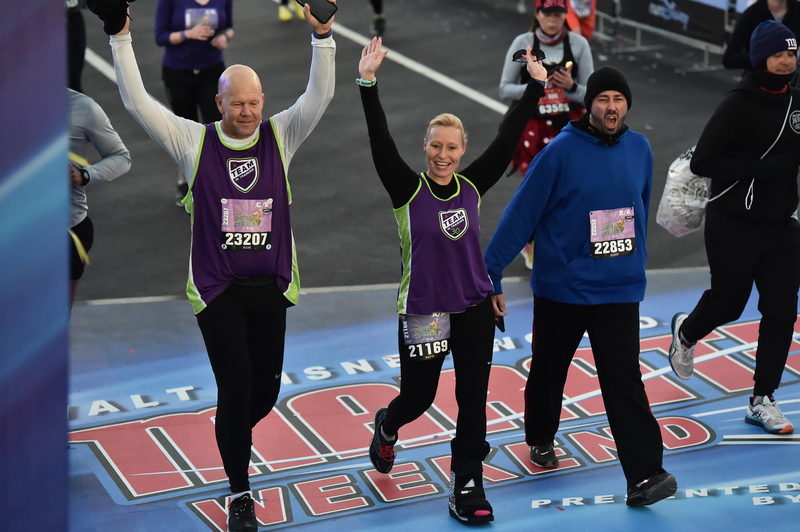 The Marathon weekend was filled with touching and inspirational stories of athletes overcoming obstacles. Disney shared the moving story of Ron Wertley who took on the Walt Disney World Marathon’s Dopey Challenge–running all 48.6 miles of the 5K, 10K, half marathon and full marathon–in successive days despite having to train while undergoing chemotherapy treatments for cancer. He was first diagnosed with acute lymphoblastic leukemia and given a 40% survival chance just after he completed the Dopey Challenge last January. But nearly a year of aggressive chemo treatments sent the cancer into a period of remission. Unfortunately, December brought news that the cancer had returned and doctors say he needs a 30-day stint in the hospital and an aggressive chemo regimen to combat the disease again. Nevertheless, Wertley was determined to participate in the Dopey Challenge (he has done all five previous ones), and he did so with the support of the Leukemia and Lymphoma Society’s Team In Training. runDisney and supporting runners raised more than $98,000 to support the Society this year. Ron Wertley completes Walt Disney World Marathon’s 48.6-mile Dopey Challenge just before a 30-day hospital stint to treat cancer. Photo ©Disney. With the nearly two decade-long run of Illuminations: Reflections of Earth coming to an end this fall, Epcot is offering a new dining package that combines a prix fixe menu with a selection of the Rose & Crown's menu, unlimited alcoholic and non-alcoholic beverages, and dessert, with patio seating outside the Rose & Crown's Dining Room along the World Showcase Lagoon for its unique view of the show. More information is now available and reservations will be available starting Thursday (January 17) for seatings starting Friday (January 18) by calling (407)WDW-DINE or visiting this page of DisneyWorld.com. 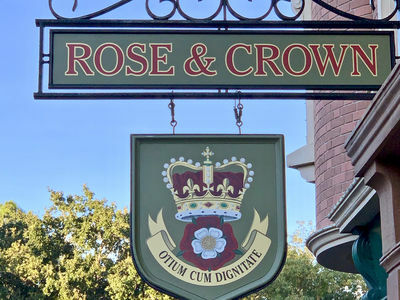 The Rose & Crown Dining Room and Pub is located on the shore of World Showcase Lagoon. Its outdoor patio provides a unique view of Illuminations: Reflections of Earth. Photo by Alan S. Dalinka. Late yesterday afternoon, Monday, January 14, Disney shared the news that a new Masai giraffe calf was just born on the savanna of Kilimanjaro Safaris at Disney's Animal Kingdom. The newest member of the tower stands approximately six feet tall, but it is still too early to tell the calf's gender. The calf and its mom, Mara, are doing well and are out on view to guests. Around the same time as we received the news from Disney, we noticed that Kilimanjaro Safaris was listed as "Temporarily Closed" not very long before its scheduled 6:30 p.m. final scheduled safari of the day. Earlier this winter, when another new calf was introduced to the savanna, safari trucks were unable to make their usual photo stops in the area of the young calf and proceeded through the area with extra caution. Remember that the animals have the right-of-way, and waits to ride may be longer than posted. The Disney on Broadway Concert Series will take the stage three times nightly from January 18 through February 25 during the Epcot International Festival of the Arts. Dining packages are available at ArtfulEpcot.com or by calling (407)WDW-DINE. (Workshops around the Festival can also be booked at the website or by calling (407)WDW-TOUR.) Passholders can receive a 10% discount for these dining packages throughout the Festival during lunch and dinner (excludes alcohol, tax and gratuity). 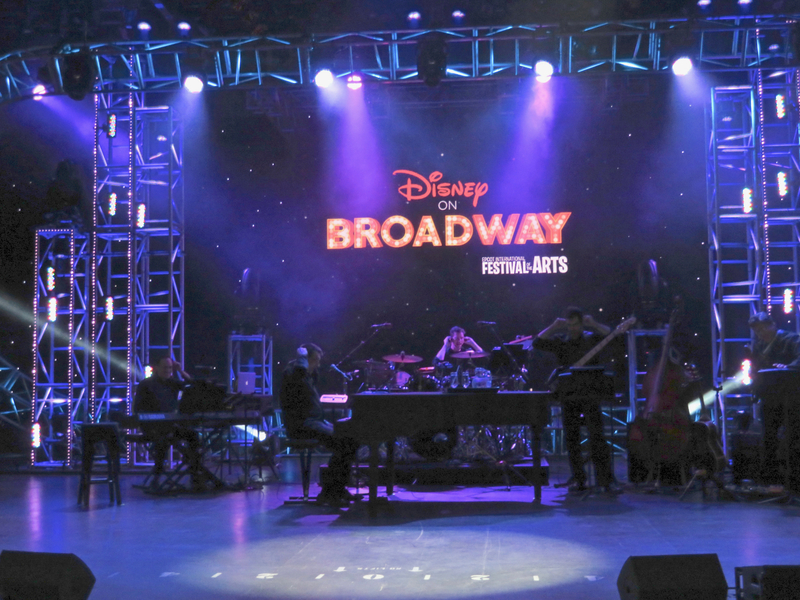 The 2019 edition of the Disney on Broadway Concert Series will run three times nightly for the entire 39 days of the Epcot International Festival of the Arts. File Photo by Alan S. Dalinka. Having been on a "beyond-the-berm" Disney Cruise this past week, we have just a few views from Magic Kingdom this week. A few new views from Disney Springs are also included together with the latest news about that entertainment, shopping, and dining area below. It is possible to see some of the "Happily Ever After" fireworks walking from Magic Kingdom's parking lot to the Transportation & Ticket Center. 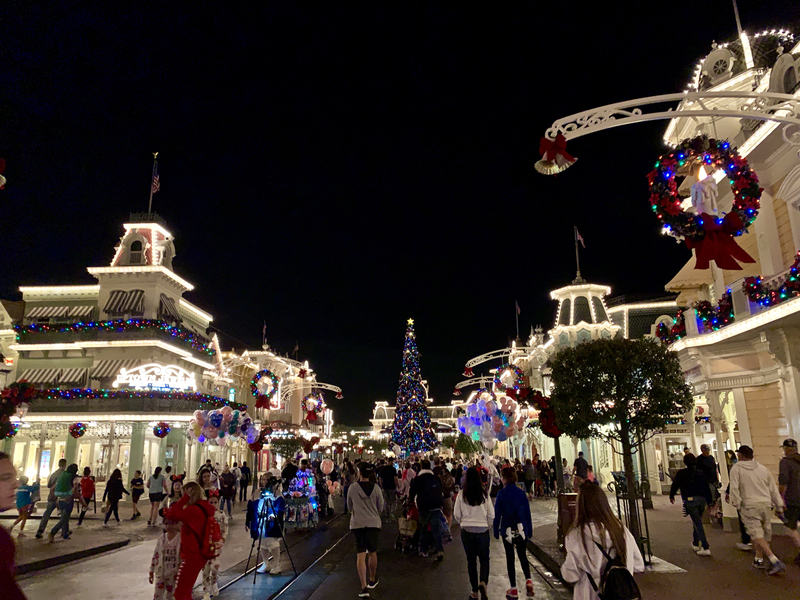 The Magic Kingdom's holiday decor remained in place during Walt Disney World Marathon Weekend. 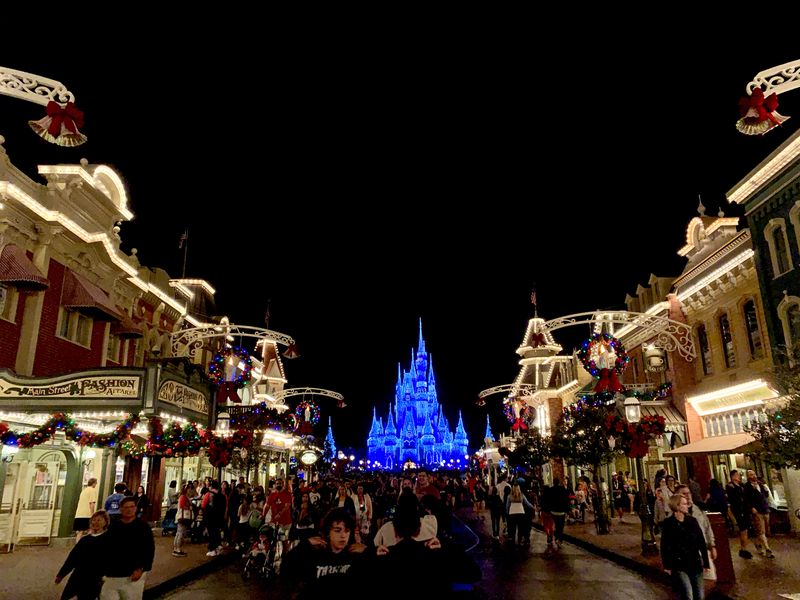 The Magic Kingdom's Christmas Tree was also in place during Walt Disney World Marathon Weekend. Peter Pan's Flight is closed for refurbishment until early February. …Disney Parks Blog announced the 12 new panelists joining the 28 returning panelists comprising the 2019 Disney Parks Moms Panel. The new members were selected from thousands of applicants and help guests plan everything from Disney Cruise Line vacations to Walt Disney World Resort and Disneyland Resort. Panelists also provide guidance about Disney Vacation Club and can answer questions in English, Spanish, Portuguese and French. Visit DisneyParksMomsPanel.com for more information or to ask a Disney vacation planning questions. …While sailing aboard Disney Magic we were unable to attend the V.I.Passholder Potion Purple pop-up event, but, for those foodies interested in where to get the purple treats being offered up on both coasts, Disney Parks Blog has you covered with its latest Foodie Guide. 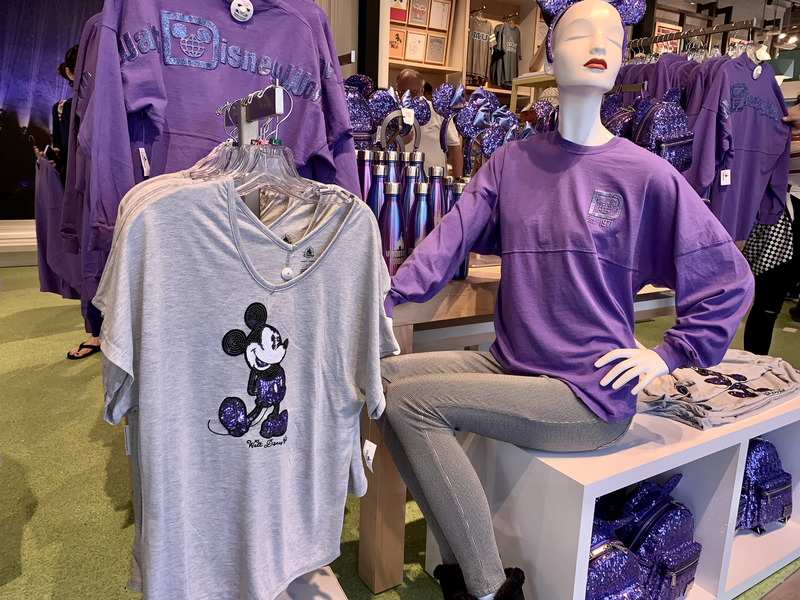 Disney Style shop at Disney Springs West Side has a large selection of the new Potion Purple merchandise available for sale. Photo by Alan S. Dalinka. …Speaking of ESPN Wide World of Sports Complex, the hub for Walt Disney World Resort sporting events was recently honored by the readers of Sports Destination Magazine as the top outside sports venue in the country. The magazine, each summer, publishes its annual Reader’s Choice Awards, where readers cast votes in a variety of travel categories. Sports Destination Magazine is a bi-monthly publication specifically designed to provide sports event managers and organizers innovative and creative strategies essential to hosting successful youth, amateur and professional sporting events. …Walt Disney World Golf is offering a series of four-week early spring junior golf club sessions from January to early March (okay, that is winter to most of the rest of the country, but still...). The camps run on four consecutive Wednesdays or Saturdays at Disney's Palm, Magnolia and Oak Trail golf courses. Visit Walt Disney World Golf's Blog for more information, or call Michael Schlager, PGA Director of Instruction at (407)454-5096, or email him at mschlager@palmergolf.com. …A new Disney-focused event series is coming to Central Florida. Give Kids The World, the Kissimmee-based nonprofit resort which fulfills wish vacations for critically-ill children visiting the Central Florida theme parks, is hosting a speaker series at their resort. The first event is an evening with Former Vice President of Operations at Walt Disney World, Lee Cockerell, on January 17 from 7:00 to 9:00 p.m. During this discussion moderated by Jeff Barnes, Lee will share about his time at the company and give insights into what makes a great leader. 100% of ticket sales go directly to programs benefiting the children and families Give Kids The World serves. Admission starts at $35 which includes general seating and parking. Other packages range from $50 for preferred seating to up to $150.00 for a VIP experience with Lee. You can purchase tickets and see the event details on this Eventbrite page. …Walt Disney World Resort revealed the 100 youths selected from across the nation who will participate in the 2019 Disney Dreamers Academy with Steve Harvey and ESSENCE Magazine, March 21-24. Each selected student receives in an all-expenses paid trip to Walt Disney World Resort for an immersive four-day experience that encourages teens "to be positive, to be 'all in' and to carry what they learn back with them, so they can relentlessly pursue their dreams and make a difference in the lives of others." The "Disney Dreamers" will visit the parks and go behind the scenes to discover career opportunities, will hear from Harvey and other celebrity and motivational speakers, and will attend career-oriented workshops ranging from animation to zoology. …Speaking of dreams, last week, Disney Parks Blog launched its new "Dreams Within Reach" series by introducing the first Disney Aspire graduate, Anthony Payne, a Custodial Cast Member at Epcot. The Disney Aspire program was launched to help the more than 85,000 hourly cast members reach their goals by providing them with education programs, coaching and job skills, and giving them the opportunity to enroll in online courses across a network of schools, with Disney paying the cost of the tuition and books. You can read more about the program and eligible cast members can apply at aspire.disney.com. 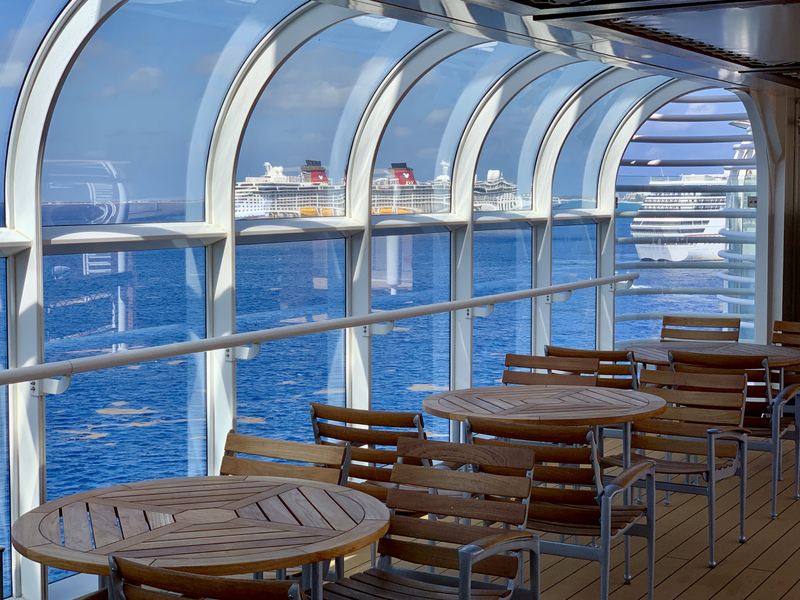 …And, finally, for more Disney vacations beyond-the-berm(s), Disney Parks Blog noted that Adventures by Disney will offer more European river cruise sailings than ever before starting in 2020. A new Rhone River itinerary through southern France joins AbD's line-up of sailings along the Seine, Rhine and Danube rivers. More news to come on January 24. 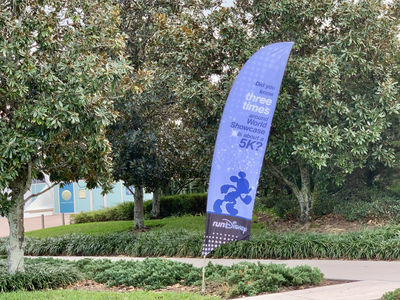 Disney Springs was decorated with runDisney banners during Walt Disney World Marathon Weekend. Note the construction wall in the background of this photo. Photo by Alan S. Dalinka. 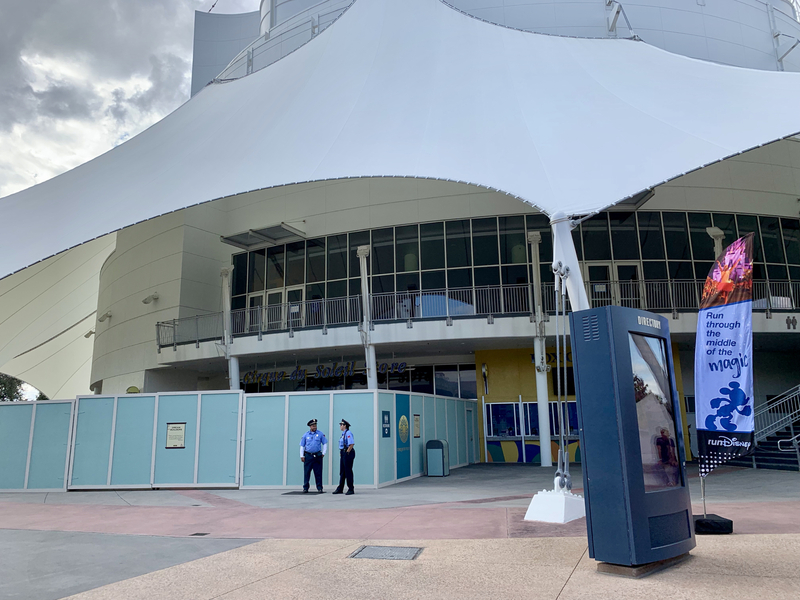 New construction walls have been installed around some of the Cirque du Soleil theater building on the West Side. 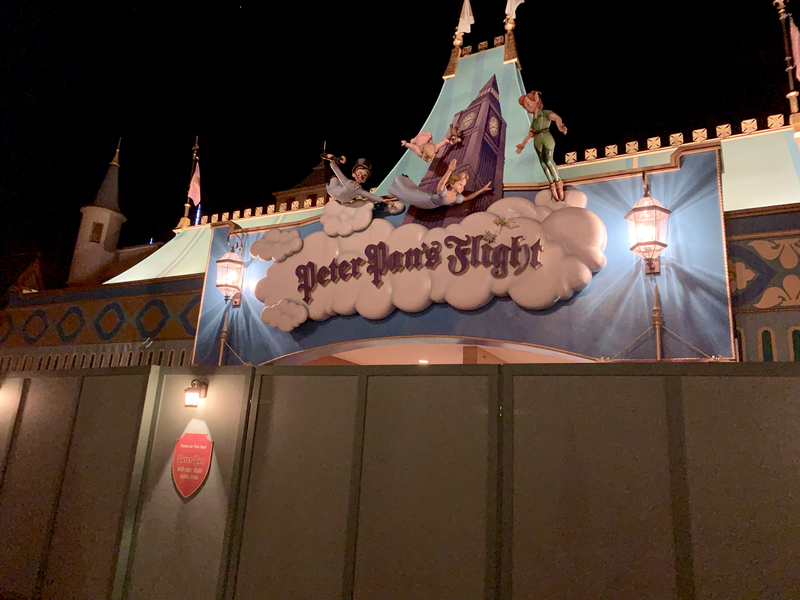 Since "La Nouba" closed on December 31, 2017, this is the first publicly visible activity at the theater that Disney and Cirque announced would next house a new show celebrating Disney characters. 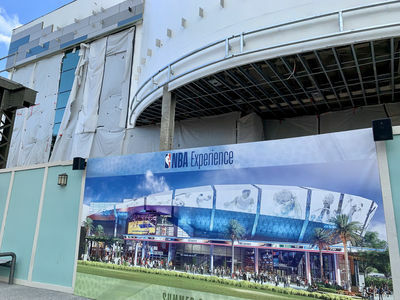 No opening date has yet been announced. Photo by Alan S. Dalinka. Also on the West Side, glass windows have been installed at the future site of the NBA Experience; it is scheduled to open this summer. Photo by Alan S. Dalinka. Partnering with Goose Island Beer Co., Enzo's will host its first "Smuggler's Series" of 2019, on Saturday, January 19, from 12-2 p.m. The Smuggler's Series is a recurring dining event featuring notable beer, wine, and spirit pairings at the Hideaway. Lunch will feature Bourbon County Stout pairings in partnership with Goose Island Brewery. Goose Island Brewery educator and industry expert, Mike Smith, will formally instruct attendees about the brewery's beer barrel aging program and provide insight on each of the beers selected to complement the dishes on the four-course tasting menu. Enzo's Hideaway Executive Chef John Miele has paired the brews with Italian specialties like aged fontina en carozza, roasted baby beets with burrata, grilled main lobster linguini, ricotta gnudi and braised lamb ragu, and a bittersweet chocolate ganache tart, enhancing the flavors of the stouts in each course. For more information and to purchase tickets, visit this page of PatinaGroup.com. The Edison's Burger of the Month Series is going to continue through 2019. The January Burger, "The Double Stack Deli Burger," has a patty that is a blend of sirloin, short rib, and brisket and is topped with thinly sliced hot pastrami, corn chips, spicy mustard, and pickles. It is served with The Edison's "famous hand-cut" fries. As we noted last week, Jaleo a Spanish restaurant by José Andrés, has updated its website to reflect that it expects to open during winter 2019. While no specific opening date has yet been published, this week the restaurant released additional details about the new venue. 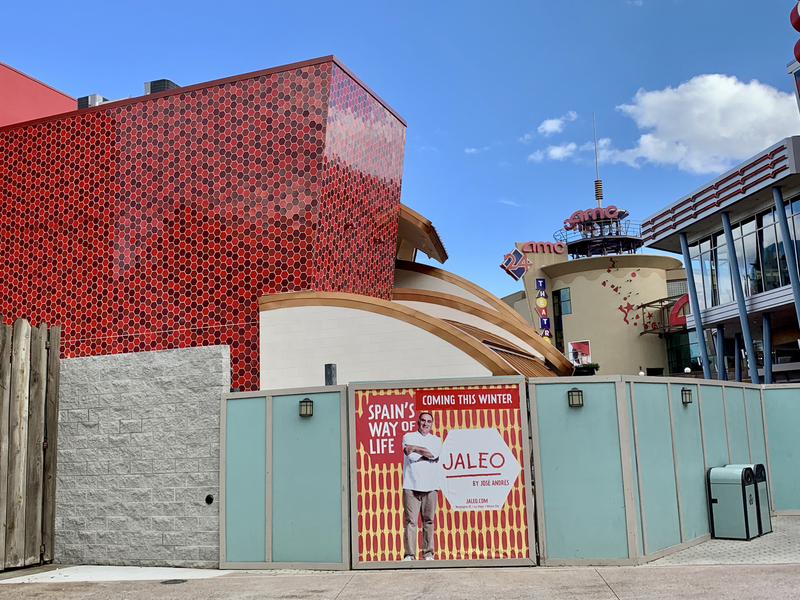 The signs on Jaleo's exterior construction walls have been updated to show that the restaurant is now expected to open this winter. Photo by Alan S. Dalinka. The 22,000 square foot restaurant is Chef José Andrés' largest venue to date. The shape of the building is inspired by an artichoke, a vegetable native to Spain, Andrés' homeland. The petals of the artichoke form pergolas, extending toward the outdoors; the two-story building's interior has no solid walls and features large windows offering views of the lake. A double height central courtyard visually connects the restaurant's two floors. "There are no cubic forms, no opaque walls, no straight lines: here reigns a plant-like organic structure with its dynamic forms. An avant-garde, expressionist and welcoming architecture," according toJuli Capella, principal at Capella Garcia Arquitectura, the firm responsible for Jaleo's design. The restaurant's colors are typical of Spanish citrus, particularly orange and lemon, and its interior includes artwork from Spanish photographers Rafael Vargas and Ciuco Gutiérrez, as well as a large mural from Marc Jesús, a famous painter from Menorca. 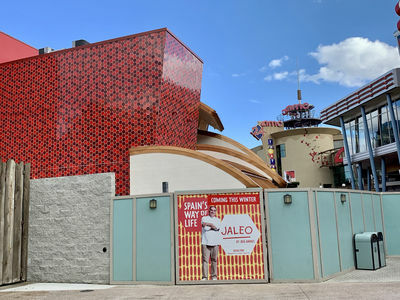 The front corner of Jaleo overlooking the main promenade of Disney Springs West Side will be a quick-service concept with Spanish street-food-inspired sandwiches and salads. The restaurant interior includes a "family-style gathering space" as well as more elegant central seating, anchored by the restaurant's open kitchen and wood fire grill. Private dining options include two terraces, one overlooking the Disney Springs promenade and another overlooking the lake. January 17, 24, & 28: 8 p.m. - 11 p.m. Location is being transformed into Jaleo, a restaurant featuring Spanish cuisine, expected to open this winter. As further incentive to purchase park tickets in advance, you can save $20 when you buy a 3-day or longer Disney Theme Park Ticket online compared to the price of the same ticket purchased at theme park ticket windows. Visit this page of DisneyWorld.com official ticket purchasing options. And, after we published, Disney Parks Blog announced ticket sales are now underway for 2019 Mickey's Not So Scary Halloween Party nights - there are 36 of them this year, including November 1. The Disney Parks Blog post is here. Tickets start at $79. Illuminations RoE has been running for nearly TWO decades, in case you want to update that in the report. Thank you for the correction. The word "two" was inadvertently left out of the sentence about Illuminations. It will be nearly two decades by the time the show is retired.